Do You REALLY want to know why I am not home? Do You Really Want To Know Why I Am Not At Home? Authors Gregory L. Wright and Aaron J. Cox explore the real issues that divide men and women in today’s relationships. They feel society has conditioned people how to think, act and look. They also believe mass media ploys are becoming more mainstream than family values. The hearts of men and women in this society have been suppressed by emotional thinking. In this new book, Do You Really Want To Know Why I Am Not At Home?, they provide insights on what men and women need to know. The best book on relationship that gives one hope in finding love! 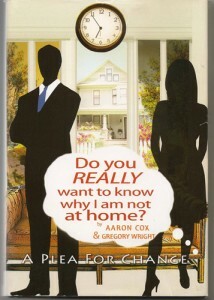 “Do You Really Want to Know Why I Am Not at Home” by Aaron J Cox and Gregory L Wright will either infuriate you or inspire you. But that is good because these authors aren?t looking for an in-between reaction. They are not afraid to make some really bold statements, and whether or not you agree with them, they certainly make you think. These two friends have got together to tell us things that none of us really want to hear – the reasons why our partners might not really want to come home to us. They admit to having no special qualifications for becoming relationship advisers other than their own experiences and those of people they know. They use their observations to try and talk some common sense into the rest of us. Occasionally there is a slight lecturing tone, which is reinforced by the general use of rather long paragraphs, and there is some generalizing, but the authors have a lot to say and, on the whole, they say it well and clearly. There is a strong Christian element too. They discuss, amongst other issues, assertiveness, equality, communication, financial matters and betrayal, and tell us firmly about the three Cs of destruction – criticism, complaining and condemnation. I particularly liked their discussion of how some people are determined to have a bad life and see the worst in everything. Cox and Wright promote respect, appropriate behavior and mutual support in couples. They have an empathetic style, reaching out to their readers and addressing us directly. This is a confrontational, thought-provoking book for those of us who want our attitudes challenged and our priorities reorganized for the better. Author Gregory Wright and Aaron Cox met in 1988 while they were both serving in the United States Air Force. They are forthcoming about not having advanced degrees of any sort and admit to being just working people. But what these two “working people” have written about present day relationships is easy to read and to the point. The authors feel strongly that there is a common denominator among men and women in relationships that needs to be addressed, and address it authors Wright and Cox definitely do. Their beginning chapter entitled “Go take your cojones out of her purse” would wake anyone up as it is about a couple’s ability to communicate. Okay. The authors discuss the need to give undivided attention, repeat or paraphrase what’s being said, to confirm again what’s said and to be aware of body language when talking with one’s mate. The authors state that “we should be listening twice as much as we speak” and give examples of good relationships as well as those in need of help. Wright and Cox insist that others are treated with respect and allowed to be themselves. “Do You Really Want to Know Why I am not at Home?” is well-written, if not technical, and addresses pointedly what the authors see as what goes wrong between a man and a woman. Authors Wright and Cox take on “stinking thinking” where a person formulates thoughts that aren’t based on facts, and come right out and tell the reader what criticism and condemnation can do in a relationship. Facts about in-laws, negative friends and everybody wanting to be “the boss” make this book good reading. The index at the end is useful and practical, and readers in general will love Gregory Wright and Aaron Cox’s layman’s “tell it like it is” style of writing. The Wealthy Speaker Show is an empowerment radio show produced and hosted by Paul Lawrence Vann. Aaron J. Cox and Gregory L. Wright are two incredible co-authors of the book “Do You Really Want To Know Why I’m Not At Home?” I’m a very experienced radio show host and have produced and hosted over 450 live shows in four years. Aaron and Gregory were by far the most memorable guests Wealthy Speaker Show listeners and fans have enjoyed. Why? It’s elementary; Aaron and Gregory discussed what is on everyone’s mind nowadays, maintaining and sustaining healthy relationships while dating or while married. During the one hour interview, these authors captured the essence of what strong relationships are all about, strengthening communities. Not only did Aaron and Gregory provide examples of how couples, husbands and wives can form a more perfect union; they also helped listeners understand how relationships transcend to children, relatives, neighbors, colleagues and humanity. On a scale of 1 to 5 stars, I give them 5 stars for being incredible authors and guest experts. I, along with Wealthy Speaker Show listeners and fans, thoroughly enjoyed Aaron and Gregory’s relationship expertise. We also appreciated their authenticity as well, and we look forward to interviewing them again in the near future. Well, to begin with, I’m so impressed with this book, I only read the summary portion that you sent me and it is really to another dimension, this book will give Men’s and Women a clear perspective of how family life should be, it covers almost all important points to help family’s succeed, I do not know if this book also is focus on the spiritual area in family which is also needed to succeed in all manner and have good relationships. I agreed with the focus of the book, I’ll say this book is a wakeup call for couples and families living, it seems to be very interesting, the Authors of this bopk focus and internal and external things that will affect family life like, financial matters, communication skill, position between a relationship, respect, changes, divorce, passion, self esteem, submission, attitudes, betrayal, knowledge etc. Perhaps this book have several delicate issues that are basic to have a successful life such as communication, finance, passion, respect, submission etc. and all are needed, but if there is something that is really destructive in any kind of relationship is when someone betray you, that hurts so much and leave such pain that is very hard to handle, and most people are worried about all these issue to the point that they forgot the biggest power and earth, which is “LOVE”, and the more destructive power and earth is betrayal, I think this book will be really of good help to others, because it’s focus on life every day out coming. I really enjoyed this small summary of this book, and I want to thank you for that, because I know what it feels to be betray by someone, that experience keep me away from people for a long time, until I become a Christian, and I still can’t say that I become over it, I don’t trust people easily, and is not anybody that I’ll will open myself to, and make them see me just as I am, I always looking how to protect myself from others, it takes me a long time to overcome some issues and make people know who I am. When people betray you is very serious issue to deal with, but I had to decide if! wanted to live or die, and I choose to live and take risk, it’s so sad when you become who you are not, force by others bad actions, but well I’m still working on it. Gregory, please accept my apology for taking so long to respond after reading your book “Do you REALLY want to know why I am not at home?” I found the book to be well written in language the common person can understand. The content is the most realistic approach I have read in regard to the very question the title of the books ask. Human relationships are a delicate balance. You are to be commended for the open way in which you have discussed this volatile subject.